Well why stop at water? I mean, after all, "they didn't cross the border, the border crossed them", right? They should be entitled to all fruits, vegetables, and meats that were grown/brought up in the Southwest/North America, because after all, it's "their land originally" according to their mantra. Plus housing...why shouldn't they be entitled to the finest properties in North America? If they didn't know what to expect, they shouldn't have attempted the journey. *Lots of things in life are such that we don't know what to expect, but do so anyway: investing in the stock market, taking a chance on kicking German tail by landing on a beach in strong winds and storm-tossed seas (a.k.a. D-Day), even asking someone out on a date. See my immediately previous comments. They apply here too. ..for no good reason other than you heard you could leech off the taxpayers on the other side? Argument from Caricature - appealing to negative images in order to "prove" your point. Firstly, how do you know they were doing it to "leech off the taxpayers on the other side"? (Hard to ask them now that they're dead, but that's beside the point). I find it far more likely they were trying to cross in order to get any kind of job, perhaps to support their spouse and kids back home. After all, remittances of US wages back to Mexico and Central America is a common practice. So you're blaming poor Mexicans for the lack of support from the Mexican Government? That makes about as much sense as blaming the American Worker's high wage demands for outsourcing to Asia, or even blaming Ohio workers when their local plant shuts down and transfers operations to Alabama. Illegal immigrants are coming across the border despite our Border Patrol's best efforts. They try one thing, the illegals will soon be creative enough to defeat it. If you're so against illegal immigration, then FIND A MEXICAN COMPANY TO INVEST IN or START A BUSINESS IN MEXICO and hire poor laborers and PAY THEM WELL!!!! Plus write your US Senator and Representative to pressure Mexico to start reforming itself to the point that IT can become an Economically Advanced Nation one day! As for the rat poison comment doesn't deserve a response, except that it's just SHEER CRUELTY! You, sir, are a disgusting embarrasment to all open-minded, tolerant, compassionate, and intelligent Americans. I'd certainly rather have those illegals there than the likes of YOU. Aside from the rat poison comment: I agree with karkyco line for line. As for water tanks in general; they should be 3-5 miles (8K) inland from the border. Mexico is not a poor country: its per capita income is over $12K a year------just the gap between the rich and poor there is obscene. All of that stated: we (the USA) have the right to close/lock at least our southern border. 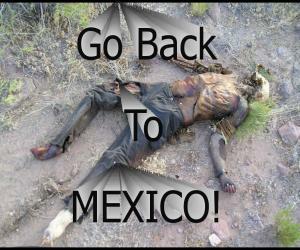 Mexico needs to grow up and take responsibility for itself. If it means a revolution SOB-----so be it. Last edited by ArizonaBear; 07-02-2008 at 07:05 PM.. Some people don't see illegal immigrants as human beings, and some of the responses on this thread proves that. Last edited by Mach50; 07-02-2008 at 07:19 PM..